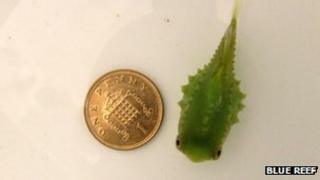 A rare baby lumpsucker has been captured by a Cornish fisherman near Falmouth. The unusual looking fish is rarely spotted in Cornish waters, preferring the colder temperatures of Greenland. The baby, which measures just two centimetres (0.78 inches) in length, was caught by Ned Bailey from Mylor in a crab pot in Falmouth Bay. It has gone on display in Blue Reef aquarium in Newquay where staff say it is doing well. Blue Reef's Matt Slater said: "Lumpsuckers have been described as one of the marine world's least graceful fish and they certainly look strange with their scaleless blue-green skin and deep bodies covered with bony lumps. "However this thimble-sized baby is incredibly comical and very cute looking and is proving to be some of the most popular creatures with our visitors." The fish's pelvic fins are adapted to form a powerful sucker on their undersides which is used for clinging to rocks, particularly in wave-washed shallow waters and also allows the father to stay anchored to the rocks beside its eggs. Mr Slater said: "At the moment he's still tiny but, after five years or more, he'll eventually grow to the size of a football and weigh up to five kilogrammes. "They're fascinating fish and people are particularly intrigued when they find out that the eggs are used as a substitute for caviar."